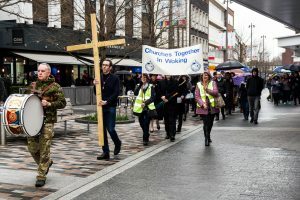 ABOUT 500 people gathered on Good Friday in Jubilee Square to see the annual Act of Witness hosted by Churches Together in Woking. A modern version of the crucifixion was staged. The enactment, written and directed by Nicole Ribet, is presented as live news report, with Justin Brierley playing the key role of the on-location reporter. The drama began with interaction between Jesus, played by Jack Osmond, St Peter (Nathan Shaw) and Judas, the betrayer, played by Daniel Nyari. 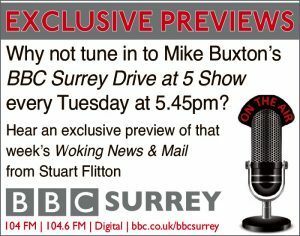 After interrogation by Pontius Pilate (Brian Beamish) and a group of hecklers, the action culminated in a staged crucifixion of Jesus, between two thieves played by Nick Moulson and Seamus Anderson. A group of guards (led by David Fletcher) manhandled Jesus and the other condemned men into position.